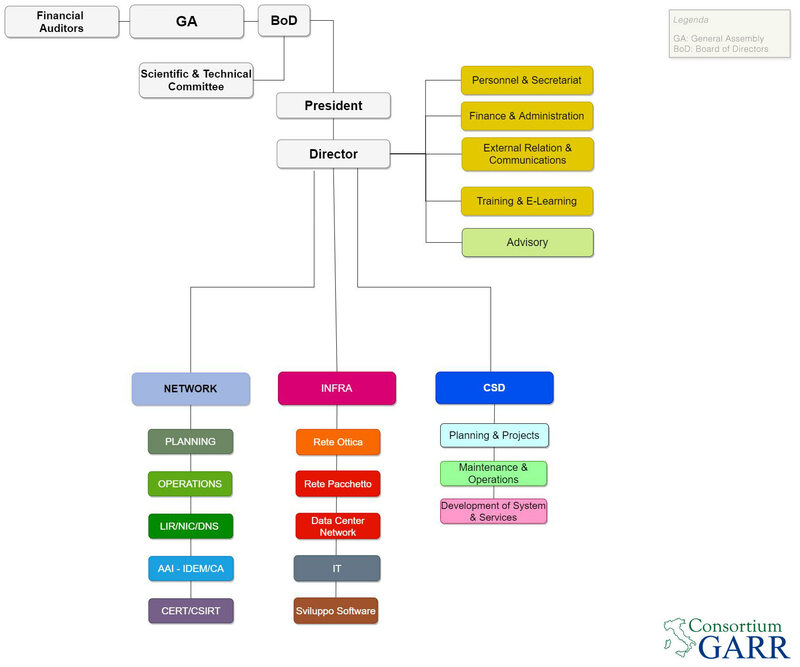 The GARR network is interconnected with the global Research and Education Networks. Together with the other National Research and Education Networks (NRENs) in Europe, GARR is a member of the organization managing and operating GÉANT, the state-of-the-art fibre “super-backbone” which interconnects all European R&E networks with multiple high-capacity links up to 100Gbps. GÉANT interconnects globally with North and Latin America, Asia, Africa, and Australia and, thanks to dedicated connectivity projects, it can reach even the most remote regions and allow European researchers to access some unique research facilities. Interconnecting to GÉANT and contributing to shape its evolution are key features that GARR offers to its users, as it allows them to be part of large international research projects and enables multidisciplinary collaborations worldwide. With over 50 million users, GÉANT is currently one of the most complex and widespread networks in the world. It is a dual layer (transmission and IP) network offering not only high bandwidth connectivity, but also advanced network services like direct optical links in an international multidomain environment. In this way, the NRENs and GÉANT can meet the demands of the most advanced user communities worldwide, e.g. the HEP, radioastronomy and supercompunting communities. GÉANT in the high-capacity pan-European backbone which interconnects the European National Research and Education Networks with multiple 100 Gbps links and offers advanced services to large research infrastructures and to the European research, education and cultural community at large. To date, GÉANT interconnects over 50 million users in nearly 10.000 scientific, cultural and education organizations across the continent. Thanks to leading-edge technologies, more than 1000 Terabytes of data are transferred every day over GÉANT. 100 Gbps circuits are now available across the core network, with a network designed to support up to 8 Tbps (terabits per second), ensuring that the network remains ahead of user demand and the data deluge. GÉANT boasts very high availability levels and an efficient management of operations that guarantees rapid resolution for any outage, thanks in part to the collaboration with all European NRENs . GÉANT, now in its fourth generation, is jointly funded by the EC and by the European NRENs, including GARR. The NRENs guide its operation and evolution though its governing bodies. GÉANT’s infrastructure and services are constantly evolving, thanks to the joint research carried out in part through specific EC-funded projects: thus for 20 years GÉANT and the European NRENs have been at the forefront of Telecommunication Technology and continue to support the R&D community’s network requirements across Europe. GÉANT is one of the largest Research and Education Networks in the world, offering dedicated support to diverse user communities, with services spanning from commodity IP connectivity to the implementation of full-fledged Optical Private Networks in an international multidomain environment. As with GARR’s National infrastructure, in GÉANT we can also distinguish three layers: physical, transmission and IP/MPLS. The physical layer is based on dark fibres, while the transmission layer is based on the Infinera technology, which already allows to deploy 500 Gbps superchannels and offer dedicated lambdas to particularly demanding users or projects. Last but not least, the packet layer supports level 2 and 3 services, thus providing both Ethernet links and IP connectivity. Most of GARR’s direct international connectivity for research passes through GÉANT. However, thanks to Italy’s geographical position, some direct connections with neighbouring Countries have also been established. These links, known as Cross-Border Fibres, are complementary to the interconnection with GÉANT, aiming on one hand to channel direct traffic between two neighbouring Countries, often for the benefit of specific collaborations, and on the other to provide mutual backup in the (unlikely) case of temporary unavailability of one of the Countries’ links to GÉANT. Currently, Cross-border fibres are active with Switzerland and Slovenia, while the design of a CBF with France is ongoing. Thanks to its numerous collaborations and intercontinental extensions, GÉANT and the European NRENs are interconnected with over 100 Countries worldwide. GÉANT directly manages specific connectivity projects with the Mediterranean region, Africa and Central Asia and participates in connectivity projects between Europe and Latin America, the Caribbean, the Far East and the Asia Pacific region. Last but not least, a long-standing collaboration ensures high quality interconnections with North American R&E networks, i.e. Internet2 and ESnet for the US and CANARIE for Canada.